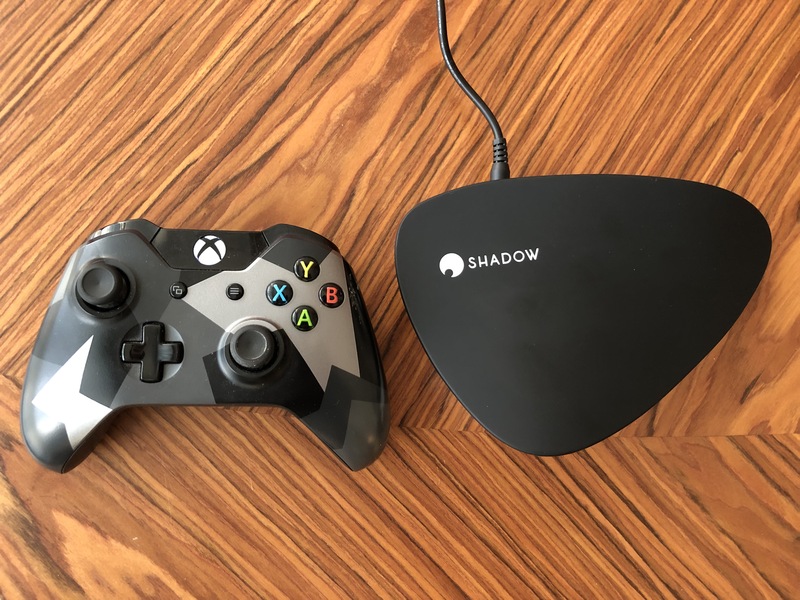 French startup Blade, the company behind Shadow, is launching a new set-top box to access its cloud gaming service — the Shadow Ghost. I’ve been playing with the device for a couple of weeks and here’s my review. The Shadow Ghost is a tiny little box that doesn’t do much. The true magic happens in a data center near your home. When you sign up to Shadow, you don’t even have to get a box. You can simply subscribe to the service without any hardware device and use the company’s apps instead. Shadow is a cloud computing service for gamers. For $35 per month, you can access a gaming PC in a data center and interact with this computer. 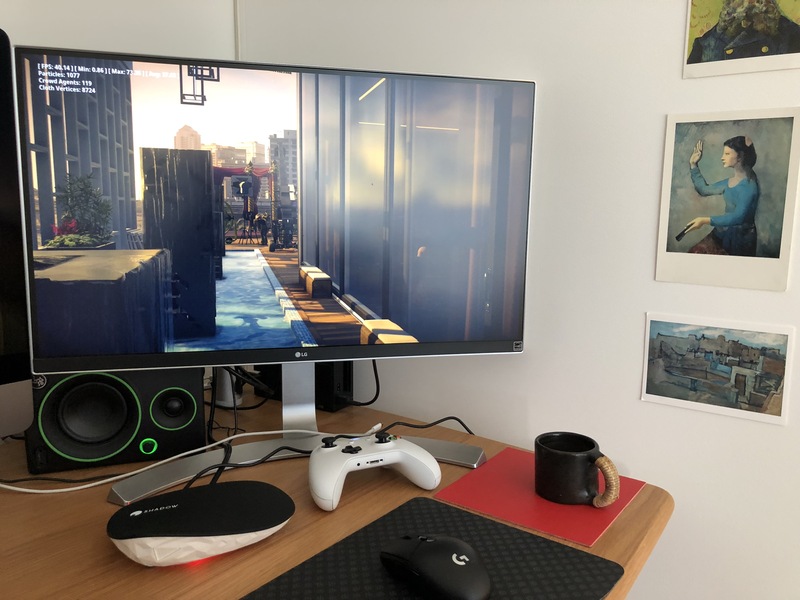 Right now, Shadow gives you eight threads on an Intel Xeon 2620 processor, an Nvidia Quadro P5000 GPU that performs more or less as well as an Nvidia GeForce GTX 1080, 12GB of RAM and 256GB of storage. You can optionally get more storage with an extra subscription. It’s a full Windows 10 instance and you can do whatever you want with it. Most subscribers now access Shadow using one of the company’s apps on Windows, macOS or Linux. You also can connect to your virtual machine from your iOS or Android phone or tablet. And now, you can buy the Shadow Ghost if you want to use the service on a TV or without a computer. I first used Shadow during the early days of the service back in early 2017. My first experience of the service felt like magic. Thanks to my high-speed fiber connection, I could play demanding games on a laptop. The best part was that the laptop fan would remain silent. But it wasn’t perfect. Nvidia driver updates failed sometimes. Or your virtual machine would become completely unaccessible without some help from the customer support team. In other words, the concept was great, but the service wasn’t there yet. Things have changed quite drastically after years of iteration on the apps, the streaming engine, the infrastructure and even the GPUs in the data centers. Blade co-founder and CEO Emmanuel Freund told me that the service has been working fine for just a few months. It’s no surprise that those technical improvements have led to less churn, more referrals and more subscriptions. In July 2018, the startup had 20,000 subscribers. Now there are 65,000 subscribers. There’s even more demand, but the company has had a hard time keeping up with new machines in data centers. Shadow is currently available in France, the U.K., Germany, Belgium, Luxembourg, Switzerland and parts of the U.S. The company simply can’t accept customers from anywhere in the world because they need to live near a data center with Shadow servers. The original Shadow box was a bit clunky. You could hear the fan, you had to rely on dongles if you wanted to pair a Bluetooth device or connect to a Wi-Fi network and there was no HDMI port — only DisplayPort. Internally, Blade has been debating whether the company needs another box. In 2017, it was too hard to explain the product without some sort of physical device — you can replace a PC tower with a tiny box. But now that gamers understand the benefits of cloud gaming, there’s no reason to force you to buy a box. And yet, the Shadow Ghost can be a useful little device in some cases. For instance, while the company has released an Android TV app and is testing a new app for the Apple TV, your current TV setup might not be compatible with Shadow. Or maybe you primarily use a laptop and you want to create a desktop PC setup with a display, a keyboard, a mouse and a Shadow Ghost. Everything has been improved. It is now a fanless device that consumes less than 5W when it’s on. 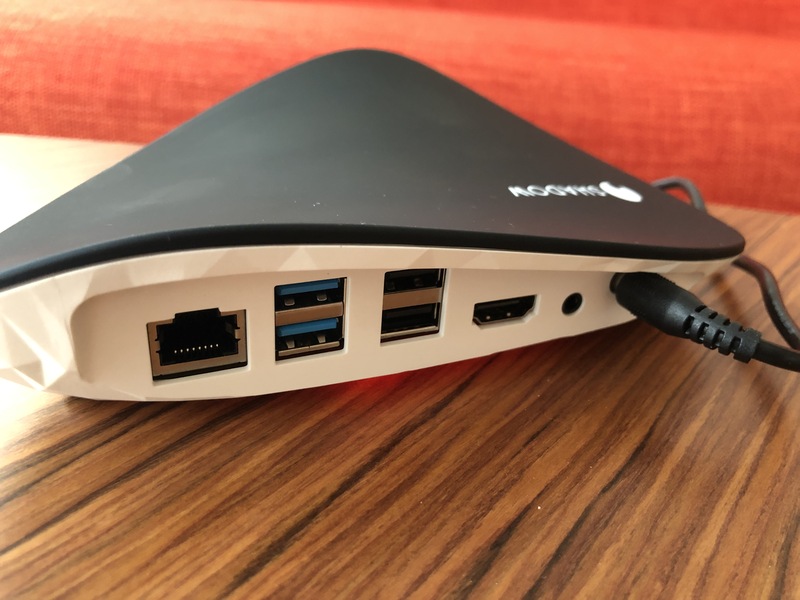 It has an Ethernet port, two USB 3.0 ports, two USB 2.0 ports, an audio jack and a single HDMI port. Bluetooth and Wi-Fi have finally been integrated in the device. When you boot up the device, you get a menu to connect to a Wi-Fi network or control your Bluetooth devices. You also can change some streaming settings, like in the app launcher. Once you press the start button, the video stream starts and it feels like you’re using a Windows computer. With Steam’s Big Picture mode, you get a convenient setup for couch gaming. I had no issue playing demanding games, such as Hitman 2. It works perfectly fine with a Wi-Fi connection and a Bluetooth controller. Using the Shadow Ghost feels just like using the Shadow app on a computer. So it’s hard to say whether you need the Shadow Ghost or not. It depends on your setup at home and how you plan to use the service. Last summer, Blade planned to manufacture 5,000 units. But now that the user base has grown significantly, that first batch could disappear in no time. It is available starting today for $140. 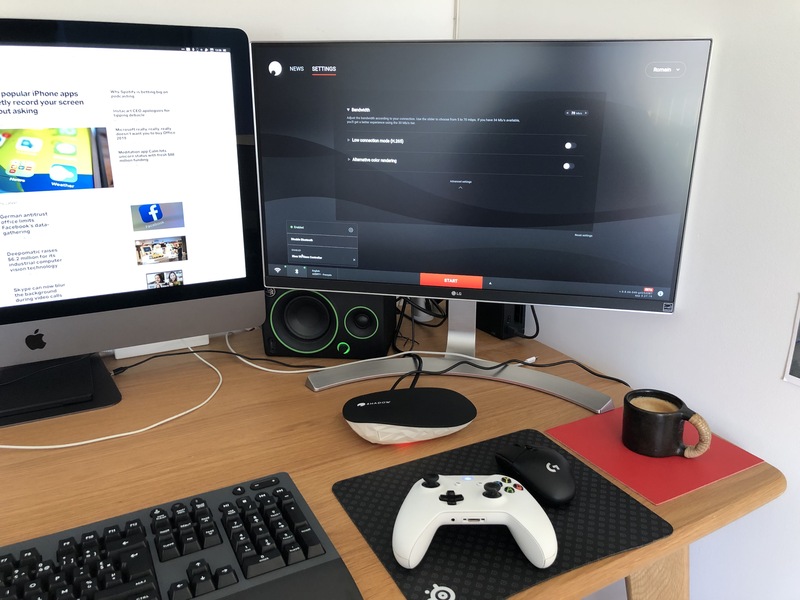 Cloud gaming is a hot space right now. While some companies have been experimenting with this concept for a while (Nvidia, Sony), it feels like everyone is working on a new service of some sort. Maybe the next Xbox is going to be about streaming a game from a data center. Maybe Amazon will offer a game library in the cloud as part of your Amazon Prime subscription. Emmanuel Freund believes that it could be an opportunity for Shadow. Everybody is going to talk about cloud gaming if Apple and Google announce new services. But the startup has years of experiences in the space and has tried hard to compensate when it comes to latency and internet speeds. It’s going to be harder to compete on content though. Game publishers and console manufacturers could start releasing exclusive titles on their cloud gaming services. That’s why Blade is thinking about new gaming experiences and exclusive content that would make Shadow more than a technical service.